Breath-taking views, vegetarian meals, shower facilities (with bio-degradable soap and shampoo), basic first-aid supplies, weekly laundry service, a music room with community instruments, an extensive library, prayer room, free clothing exchange, and limited phone and internet access. Phone cards are required for long distance calls. Our water comes from a mountain spring – our electricity, from the sun. 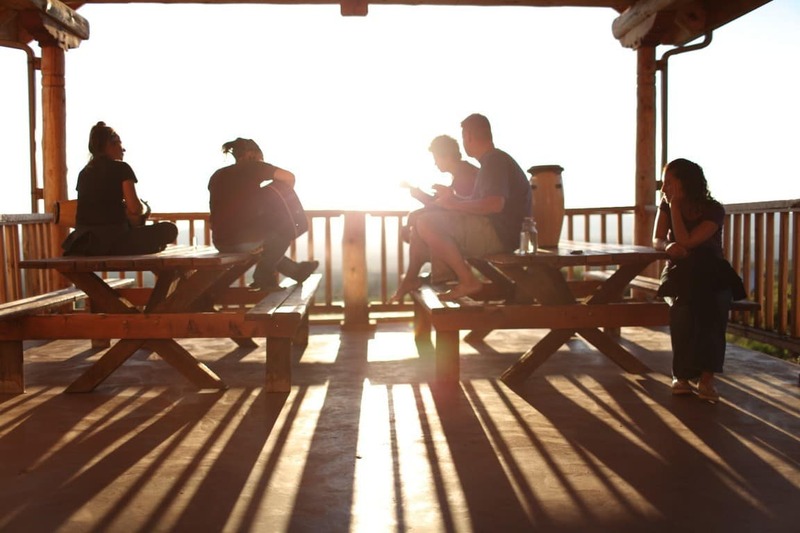 The Foundation’s rustic setting is deeply quiet and naturally beautiful, built and maintained by loving service. For younger children, there are a limited number of children’s books, toys, and art materials, an outdoor sandbox and a swing set. Older children are encouraged to participate in community activities as they feel comfortable. Parents are responsible for their children’s supervision at all times. For further information, please consult with one of the Summer Steward Guardians. A group of stewards play music on the portal.